The last French cruiser-battleships, and by far the most imposing, were the two Edgar Quinet (sister-ship Waldeck-Rousseau), which constituted at the same time a synthesis of all the acquired experience in design for this particular type and an additional milestone in the genre. Laid down in 1905 and 1906 they were launched in 1907-08 and completed in 1911, and had an active career lasting until the 1930s. 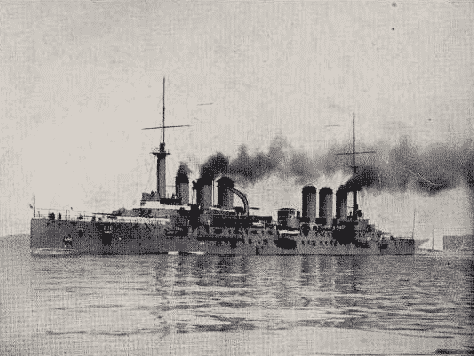 Jeune École (Young School)’s own Admiral Ernest François Fournier strongly advocated for a fleet of armored cruisers based on the Dupuy de Lôme type back in the 1890s, for long-range commerce raiding, dealing with older battleships, and reconnaissance. 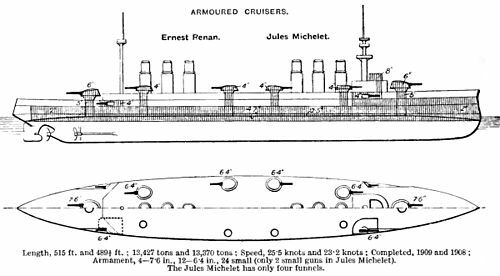 Twenty-four armored cruisers followed, the Edgar-Quinet being the last, and like the previous Ernest Renan, their design was revised during construction, causing a delay of delivery. Although they had been the most powerful armored cruisers built by France, they entered service two years after the first British battlecruiser of the Invincible class, and therefore were obsolescent when accepted in service. Indeed, because of its “semi-experimental” shipbuilding practices, France was late in the game and lacked any battlecruisers, although they had been planned by 1912′ Durand-Viel program, not to mention the few dreadnoughts in service compared to Germany and UK. This was however not that crucial as most of the French fleet had to operate in the Mediterranean, against less advanced fleets, like the Austro-Hungarian Navy. Moving 14,000 tons and 160 meters long, they were among the largest French warships in 1914. They had been largely inspired by the Ernest Renan (1906), but were taller and better armed, including a uniform artillery distribution of the monocaliber type. One of their particular feature was the adoption of refrigerated ammunition holds, now a standard for French ships since the Battleship Iena explosion in 1907. Their artillery was indeed simplified (this was less a nightmare for supply) with the suppression of 162 mm (6.3 in) guns for a complete fourteen 193 mm (7.5 in) battery (rate of fire, up to four rpm) complete with only 65 mm (2.5 in) QF guns to deal with TBs. The larger guns were divided into two double turrets, six single, and four in barbettes. The 65 mm (9-pounder guns) were distributed in casemates and the others on the superstructures. However in 1918 the threat of aviation made for a removal of 12 guns, replaced by tow 65 mm anti-aircraft guns and tow of 75 mm (3.0 in) AA guns. As customary, the two armoured cruisers were given also two 450 mm (17.7 in) TTs on each side, submerged. Their armored belt was 150 mm (5.9 in), reduced to 70 mm (2.8 in) forward and 40 mm (1.6 in) aft. The lower main deck was 65 mm (2.6 in) thick. The upper deck was 30 mm (1.2 in) in thickness. Gun turrets were 200 mm (7.9 in), barbettes 200 mm, casemates 194 mm, however they were linked by transverse armored bulkheads ranging from 194 mm to 120 mm (4.7 in) internally. Conning tower was 200 mm. 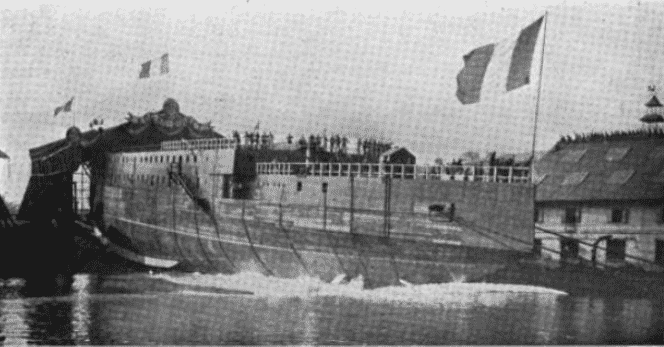 Rousseau survived two torpedo hits thanks to an efficient cofferdam built into the lower hull, doubled by a longitudinal watertight bulkhead. 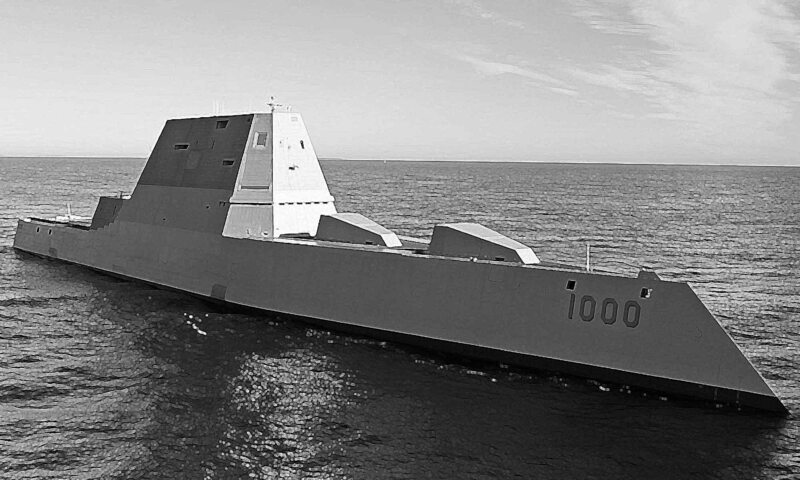 Unable to sail past 23 knots, these ships arrived when the battle cruisers introduced turbines. They had three propellers, three 4-cylinder VTE (triple expansion) engines, 40 Belleville boilers, coal-fired, for a total output of 36 000 hp. The boilers were truncated into six funnels in two groups of three, characteristic of French cruisers at that time. All of these engines were separated in watertight compartments, to ensure at least the minimal propulsion of the ship was hit. In addition electrical systems were fed by six electric generators. Coal capacity amounted to 2,300 t, which made for a 5,100 nautical miles range (9,400 km; 5,900 land miles) at moderate cruise (10 knots). Their career was very active: Together with the Renan and the Michelet, they formed the 1st light division of the Mediterranean. They patrolled in the Straits of Otranto and ensured the Austro-Hungarian blockade. Both ships covered the seizure of Corfu in January 1916. In August 1914 quinet took part in the pursuit of the German squadron of Admiral Souchon (SMS Goeben). She was present at the Battle of Antivari. Quinet also carried out a rescue mission after the war of the population of Smyrna (Great Fire of Smyrna, Greek-Turkish War), embarking 1,200 civilians in 1922. 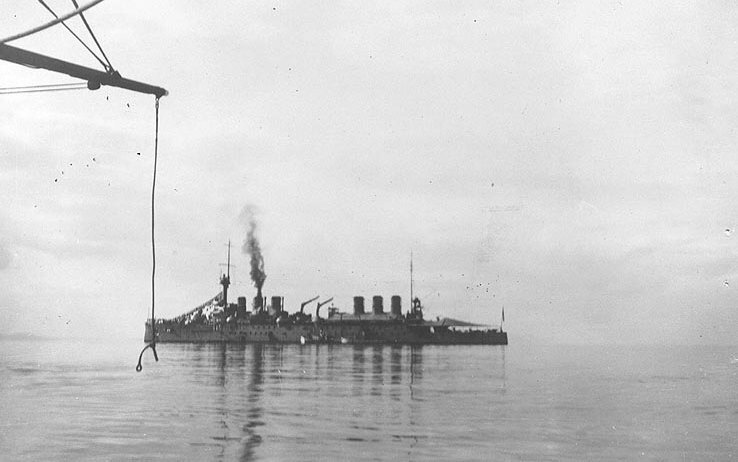 In 1925-27, the Quinet underwent a complete overhaul, which made her a training ship, with a new weaponry, a new appearance, including seaplanes under shed. She hit a reef off Cape Blanc, Algeria and sank in 1930. She served in the Adriatic and survived in 1914 two torpedo hits from Austrian U-Boats in October 1915 and duelled with several Austro-Hungarian destroyers. She served also in the Ionian and Aegean Sea until 1918. After the war she sent to the Black Sea to support the “whites” Russians of General Wrangel. At her arrival however her crew short-lived mutinied over poor conditions. At first assigned as flagship of the Far East fleet in 1929, she later returned to France to be disarmed in 1932 but was broken up only in 1941-44 to be sold fro scrap. Propulsion 3 screws, 4 VTE engines, 40 Belleville boilers, 36,000 hp.